Hirren is a Market Maker and Technology business leader with over 25 years’ experience in leading business units and practice groups for global engineering and IT services business. He has been serving Engineering to Enterprise IT functions of various industry verticals across Product creation, Product realization and After-sales processes with Level 0 to Level 4 technologies. He is chasing an aggressive growth strategy for manufacturing and hitech segments delivering mega business impact through ecosystem consolidation and Fully Loaded Product line management. One of the key attribute has been to support /incubate new ventures with initiatives like - Digital Enterprise , Smart City, Light Weight Composites ,Industrial Internet of Things ( IIOT ),Cognitive Robotics, ‘Economy as a Service’ & Augmented Reality. He supported expansion of a German Venture for Thermo plastic COMPOSITE Mass Applications by onboarding a 1 Bn$ enterprise as investor / partner. He has been Avid Speaker on New Gen Technology forums on Industry trends and Indo-EU collaboration. He is Co-Founder of Indian Business Forum e.V ( South ) to promote Indo-German collaboration with an Indian point of view – An official body registered at Germany and supported by Indian Embassy. Most recently, he is global head of HCL ERS business in Industry segments (Energy, Consumer Electronics, Building Systems, Robotics, Process Automation and Intelligent Machines). In addition, he devised HCL’s Industrial IOT and PLM strategy along with McKinsey and has formed separate team across US, Europe and APAC to execute the same. He pioneered new lines of business like ‘Product Configurator applications’ for HCL industrial customers and a ‘Mechatronics Center of Excellence’ for CSC Hitech customers. He specializes in Smart product design and in Big Data Analytics based applications to generate new revenue streams. Recently, he has been leading a mega-million initiative to implement Industry 4.0 led transformation in a global industrial group directly steered by HCL CEO. He has been operating out of Germany / Europe since over 17 years working with several companies like CSC, ABB and Siemens in different business roles working with teams at Germany, India, Sweden, Switzerland, UK , Denmark , Austria and USA. 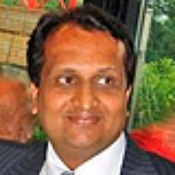 He has been trained by Revenue Storm, USA in Demand Creation and Fulfillment Techniques to deliver mega business impact. He is a German Citizen and lives with his family at Stuttgart, Germany.